Although I’ve never really understood the need for a 3D space that stages the 1D world of Second Life, I took a tour to SL today. 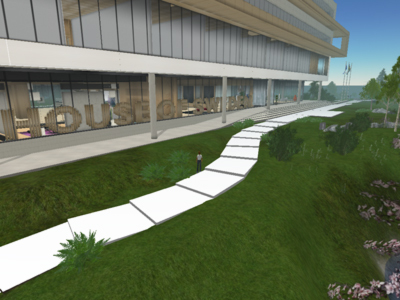 Created an avatar, downloaded the software and teleported myself to the House of Sweden - an afterthought: it might be a good idea to read up on Second Life in the Second Life Wiki before entering SL, or else you’ll probably end up fiddling with all the menus and buttons, which I did. I met three avatars there to network with. They talked about what a boring place it was and how they were stuck in a place they couldn’t get out of as teleporting inside SL didn’t work on this very day. Couldn’t join the conversation though, as I fumbled around among the menus. Clicked too much too fast and SL crashed. When I returned to the House of Sweden a little bit later, the place was empty, no not empty, desolate. See the snapshot of my avatar before House of Sweden.